This Ice Machine Repair Training Class will host equipment and factory trainers from Scotsman, Ice-o-Matic, Hoshizaki, & Follet. This is a unique opportunity for technicians to learn the specifics of four different brands in one four day session. 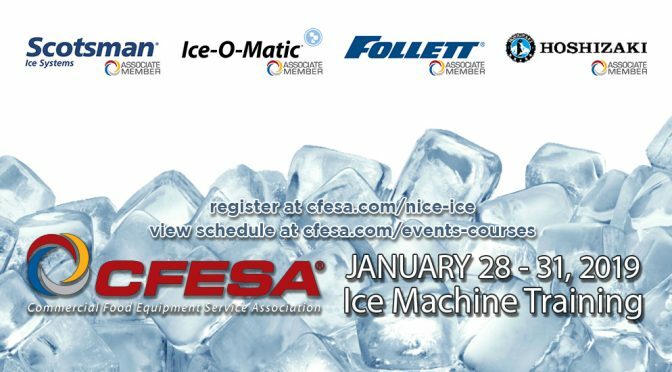 CFESA is pleased to announce our 2019 Ice Machine Training Class. The skill level for participants attending this course should be mid-level to seasoned technicians. Entry level technicians would not have the skill set needed to participate in this course. This class is limited. Seats are not considered “reserved” until full payment has been received. Qualifications: Technicians must be familiar with electric, gas and steam theory, and have a working knowledge of foodservice equipment. Again, Entry level technicians would not have the skill set needed to participate in this course. Prerequisite: There is no standard prerequisite at this time, but we do ask that managers take into consideration the complexities of ice machines and determine if your technicians are suited to attend this training.